Microsoft and Google might have only recently entered the laptop-making game, but they're both getting very good at it – and we have hard evidence in the form of the Surface Go and the Google Pixelbook. But which one should you be making your next computer? Here we'll break down how the laptop/tablet hybrids stack up in all the key areas, from design to specs. While these two devices aren't directly comparable in terms of price, they should both be near the top of your list if you're thinking about buying a new computer. Both the Surface Go and the Google Pixelbook are easy to love from a design perspective – though Microsoft's 2-in-1 is lighter, more compact, and sleeker. Its smaller dimensions means it's more portable, if that's important to you. The Surface Go features a 10-inch display running at 1800 x 1200 pixels, with the main body of the device measuring 245 x 175 x 8.3 mm (9.65 x 6.90 x 0.33 inches). If you're getting the Type Cover with it, which we assume you are if you're comparing it with the Pixelbook, that obviously means it's a little thicker when closed. There are four colours to pick from – black, blue, burgundy and silver, and the whole package looks very slim and sleek indeed. Overall we reckon the MIcrosoft Surface Go just has the design edge over the Google Pixelbook, but it's close. Google has certainly made the Pixelbook distinctive, with a two-tone silver and white design that adds a touch of class (and that's the only colour option you've got). The 12.3-inch display runs at a resolution of 2400 x 1600 pixels, and overall the laptop is 290.4 x 220.8 x 10.3 mm (11.4 x 8.7 x 0.4 inches) when closed. Surprisingly for a Chromebook running the lightweight Chrome OS, the Google Pixelbook is very well tricked out in terms of specs (hence, perhaps, the high price). You get a dual-core, 7th-generation Intel Core i5 CPU, 8GB or 16GB of RAM, and 128GB, 256GB or 512GB of internal SSD storage. Those are decent specs for a Windows laptop, and are more than enough to run Chrome OS. The Surface Go specs are inferior in comparison – just an Intel Pentium Gold 4415Y processor, then 4GB or 8GB of RAM, and 64GB, 128GB or 256GB of SSD storage. With that spec sheet the Surface Go is obviously aiming more for the Apple iPad than the Google Pixelbook, which is why you get Windows 10 S Mode installed by default. Every laptop is a compromise between power and price – the Pixelbook has better specs, but the Surface Go is cheaper, so it's really up to you where you want to strike the balance. The Surface Go might struggle to run serious desktop apps like Adobe Photoshop, but of course the Pixelbook can't run desktop apps at all. The Pixelbook has two USB-C ports whereas the Surface Go only has one, and both devices have a 3.5 mm headphone jack integrated in the chassis, but only the Microsoft 2-in-1 has a microSDXC memory card: that's maybe something to bear in mind if you need to transfer a lot of pictures over from a digital camera. The Surface Go is also the only device with a rear-facing camera, if you think you'll need one. If you think you might want to go full tablet with your next computer, go for the Surface Go – the Pixelbook can act as a tablet, but the screen doesn't detach, so you need to fold the display on top of the keyboard to use it in tablet mode (and Chrome OS isn't yet as adept at adapting to the tablet form factor as WIndows 10 is). If you're going to be doing a lot of typing, on the other hand, then the Pixelbook might be a better bet. The optional Signature Type Cover (yours for £99.99/$99.99) definitely looks the part, but ultimately you're still clipping on a keyboard cover rather than using an actual, full-sized keyboard – so it's not as suitable for long typing sessions. Both the Surface Go and the Google Pixelbook have touchscreens and optional, official stylus pens you can use if you need more precision than your finger can offer. In terms of drawing and sketching apps it's about honours even, because the Pixelbook can run Android apps as well as web apps. That's perhaps one of the most important specs here: the Pixelbook runs the online-focused Chrome OS, plus Android apps, while the Surface Go runs Windows 10 S Mode and can be unlocked to full Windows 10 if needed. That should give you some idea about which one is going to suit you best. 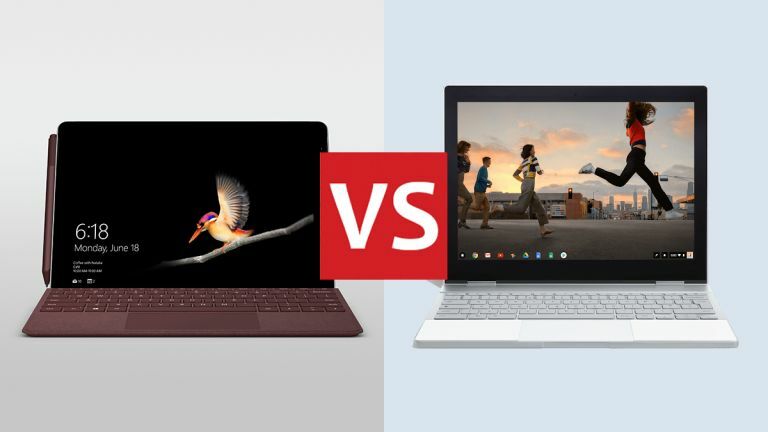 It can be difficult to pick between two very good laptops, but the Surface Go from Microsoft and the Google Pixelbook are distinctive enough that you've got a lot of ways of deciding which one is going to be better for you. They're both excellent devices, but they serve different kinds of computer user. The OS is a good place to start – do you prefer the online-focused, lightweight Chrome OS to the more heavy duty and versatile Windows? If you already spend much of your computing time inside a browser, then a Chromebook could be for you, and the Pixelbook is one of the best out there. If, on the other hand, you're interested in something that's ultra-portable, and that you can just pack up and move at a moment's notice, the Surface Go could be a better bet. It's significantly smaller and lighter than the Pixelbook, and much easier to use as a tablet. Finally there's the price – if you're on a budget then you're probably not considering the Pixelbook at all (there are plenty of other, cheaper Chromebooks out there). We've been very impressed with both the Surface Go and the Google Pixelbook, but that doesn't mean that both are going to suit you equally well.